Stylish details make this mock two-piece short party dress a chic choice for your special-occasion event. Lovely in soft blush pink, this semi-formal dress has a sheer panel at the midriff that gives the trendy look of a two-piece dress. 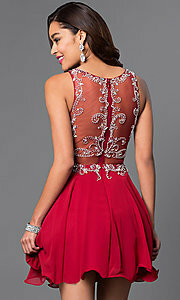 A sweetheart lining can be seen through the sparkling jeweled illusion bodice. Available in misses and plus sizes, the figure-flattering short pink dress has a bateau-neck bodice with adorned with sparkling beading that transfers to the sheer back. Dazzling gemstones crown the natural waistline on the short a-line chiffon skirt that flows to a flirty rolled hemline on this adorable party dress. Under $200 for graduation parties or rehearsal dinner, this mock two-piece short pink party dress is an eye-catching style for your event.